Burkwoodii is a pink-budded and white-flowering species of viburnum, a deciduous shrub whose red summer berries turn to black in the late fall. Burkwoodii is known among other viburnums to posses a particularly good tolerance for warm climates. It has a cultivar called Mohawk that develops deep red flower buds, which open to reveal a white petal with a red reverse. The shrubs are hardy in USDA Zones 5 through 8 and are free-flowering from spring into summer. 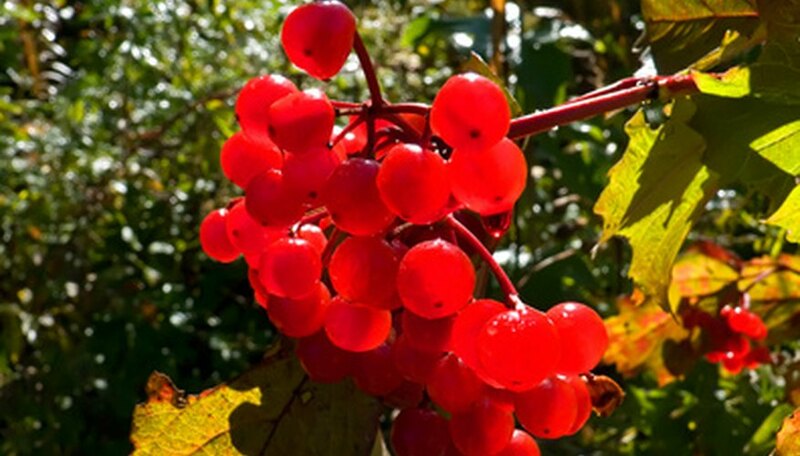 Viburnum requires pruning once every five to six years to remove non-flowering wood. Occasional grooming is necessary to remove dead or damaged tissue. Inspect your viburnum at least once a year to look for diseased, dead, damaged, broken or otherwise compromised plant tissue. Cut away any that you find, back to the point of healthy tissue, or down to the parent branch. Lift any diseased cuttings from the canopy and from the soil below to prevent spreading pathogens. Thin your viburnum shrub once every five or six years to remove the oldest branches that are no longer producing flowers or are producing diminished bloom. Remove at least half of these older branches down to the crown of the plant. Cut back all inward growing or abrading branches to improve air flow and sunlight penetration into the center of the shrub. Reduce the length of the remaining branch tips to re-size or reshape the shrub, if needed. Prune viburnums in spring. North Carolina State University advises not pruning after July 4th.